NSW Architects Registration Board administers the Architects Act 2003. The Board protects consumers of architectural services by ensuring that architects provide services to the public in a professional and competent manner. NSW ARB accredits architectural qualifications for the purpose of registration, informs the public about the competence of individuals or companies providing architectural services. Architects in NSW must by law be registered with the NSW Architects Registration Board. To search the NSW Architects Registration Board's register ... click here. FUMAPEST Camden Termite & Pest Control 1300 241 500 are licensed installers of the KORDON Termite Barrier in buildings during construction. 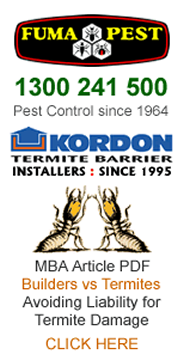 KORDON Termite Barrier for Builders is manufactured by Bayer Australia • complies with AS 3660 and is CodeMark Accredited to meet Camden Council requirements. Find NSW Govt DFT Licensed Home Builders in Camden Council region. Camden Council TPO Tree Preservation Orders • Camden Council Application Forms • Tree Removal • Tree Lopping • Tree Pruning • Stump Grinding & Removal. Find Vets • Veterinary Hospitals • Surgeons • Clinics in Camden Council region. Australian Institute of Architects • almost 10,000 members across Australia and overseas • Formed in 1930. Australian Institute of Architects aims to advance architecture, maintain the integrity and standing of the profession, promote the profession's views nationally and internationally, and encourage the study of architecture. Architects Accreditation Council of Australia is the national organisation responsible for advocating, coordinating and facilitating national standards for the registration of architects in Australia. Phone 02 6230 0506. AACA is constituted of nominees from all State and Territorial Architects’ Registration Boards in Australia. It is not a Registration Authority and can only make recommendations to the various Boards. The decision for the registration of architects lies solely with the Boards. Building Designers Association members are professionals produce the design for residential, commercial or industrial projects and prepare documentation for most of the building work carried out. FUMAPEST Camden Pest Control 1300 241 500 for safe effective pest control of cockroaches • ants • bed bugs • fleas • rats • mice • spiders • bees • wasps • silverfish • bird proofing • termite inspection reports • termite control • termite barriers • termite baiting.